Police are investigating the incident as a robbery. Video captured on Toronto's transit system shows a woman yelling at another passenger to "go back to China." Update (08/02/2018): Toronto police told HuffPost Canada that Tashia James, 19, turned herself in a at 1:30 a.m. Wednesday. She was arrested and has been charged with robbery and failure to comply with probation. 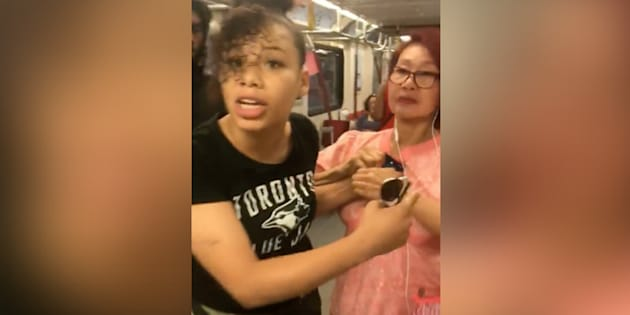 A video captured on Toronto's transit system shows a woman yelling at a passenger to "go back to China." Margaret Anthony filmed the incident while on a train near the city's Eglinton West station on Saturday. The clip shows a younger woman in a black T-shirt in a confrontation with an older passenger, a nurse who Anthony said is named Marilyn. A man is also seen with them. "When I heard the young girl yell 'go back to China,' I was furious because I'm half-Chinese, so the smartest decision I made was pulling that alarm," Anthony, a member of the Canadian Armed Forces, told HuffPost Canada on Tuesday. Anthony said the run-in started after the younger woman asked a man for a cigarette. She said she assumed the nurse was filming her and demanded she delete the video. Anthony, 33, said she decided to intervene when she noticed the two were "grappling" over the cellphone. "Stop assaulting her! Leave her alone!" Anthony yells in the video. Anthony said the young woman ran away after she noticed the incident was being filmed. Anthony said she felt compelled to share the video on social media because she wants the suspect to be held accountable. "I couldn't stand idly by and listen to her speak this way," she said. Toronto police Const. Caroline de Kloet told HuffPost Canada that officers have spoken to the victim, who reported the incident shortly after 3:30 p.m. on Saturday. It's being investigated as a robbery. A TTC spokesperson told HuffPost that the organization condemns the incident in the "strongest terms" and is working with police to assist in the investigation. The confrontation comes just days after Toronto police arrested a 50-year-old man in connection with a "suspected hate-motivated crime." Lombray Ball was charged after footage of a man berating a Muslim family last week at the city's Jack Layton Ferry Terminal spread like wildfire online.